Frieda Zamba "1998 Woman of the Year"
Four- time world champion Frieda Zamba rose to the top of the surfing world against all odds. Born and raised surfing the mediocre conditions of Flagler Beach on the East Coast of Florida, Zamba trained at an early age to become one of the most accomplished surfers ever. 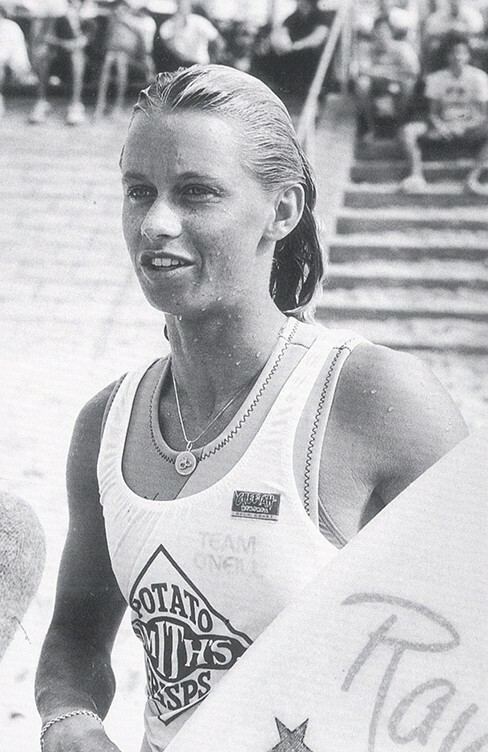 Besides winning the title in 84, 85, 86, and '88, Zamba holds an ASP women's tour record for finishing the circuit in three for six straight years. Her tenacious competitive instinct and radical style in a variety of conditions far outweighed her humble beginnings as a surfer on the East Coast. Whether it was two-foot Huntington Beach, where she dominated the competition in one of her many Op Pro victories or overhead Bells Beach, Zamba knew how to get the job done. She credits much of her success to the constant support she received aIong the way from her husband, manager, shaper, and coach, Rea Shaw. After 10 solid years as an ASP veteran, Zamba returned to her home in Florida to concentrate on her family and new career as a sales rep. She now handles the Southeast territory for Spy sunglasses.